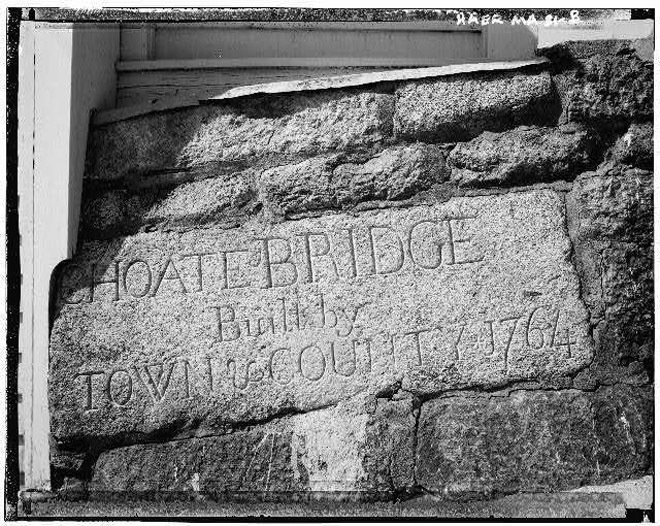 The Choate Bridge–what a bargain! 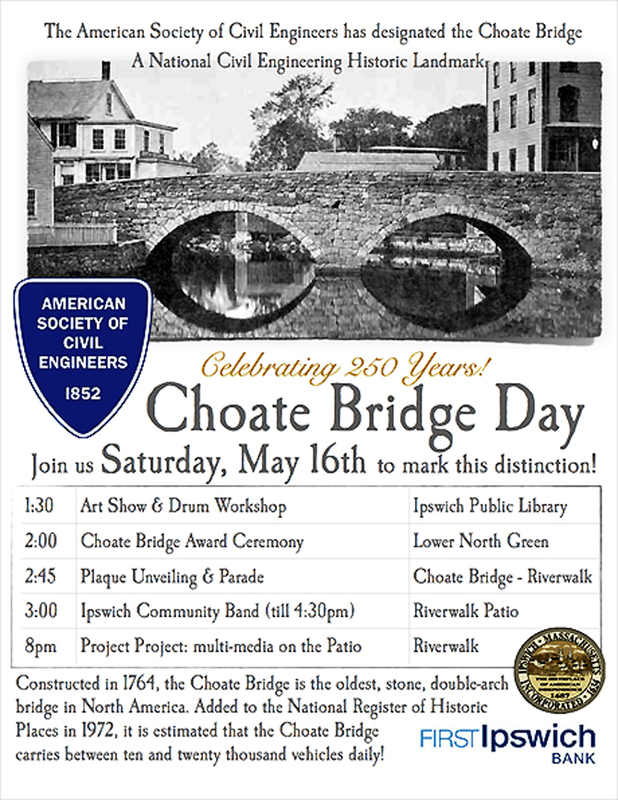 On May 16, 2015, the Choate Bridge was closed to traffic briefly so that the people of Ipswich could partake in a ceremony sponsored by the Ipswich Historical Commission and the American Society of Civil Engineers to the Choate bridge for its 250 years of service. 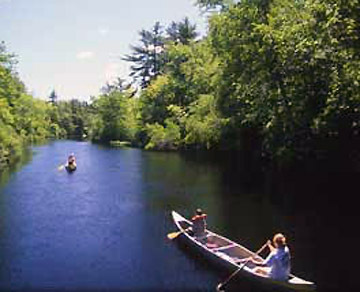 The first settlers of Ipswich forded the river near the present-day dam, just as native Americans had done for millennia. It would be a dozen years before the first cart bridge was built over the river, seven years after the General Court ordered that the Bay Road would be laid out from Boston to Portsmouth, to be constructed by each town along the way. Distances on the Bay Road were marked with stone pillars. 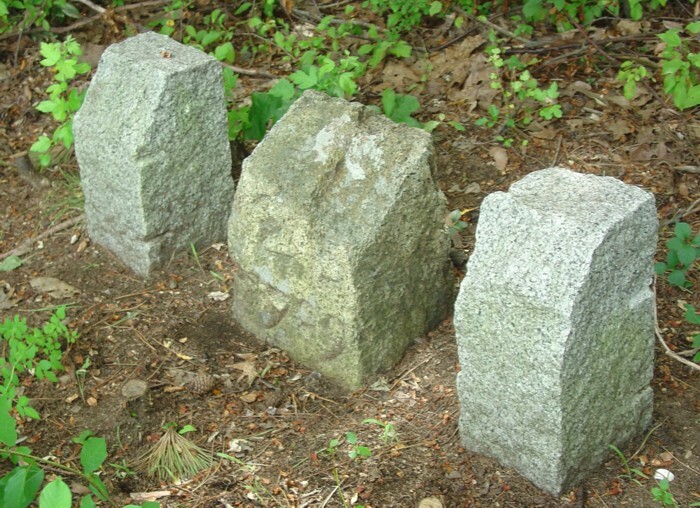 The stone that marks 25 miles from Boston can be seen along Rt. 1A in front of Appleton Farms. 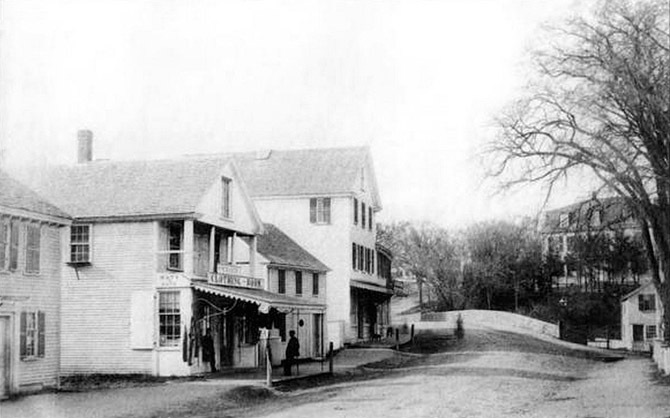 South Main St. and the Choate Bridge at the end of the 19th Century. The wooden cart bridge frequently fell victim to floods and rot, and was rebuilt several times. By 1764, it was deemed to be too narrow by six or eight feet, and a new one twenty feet wide was planned by the Town. The County agree to bear half the expense. 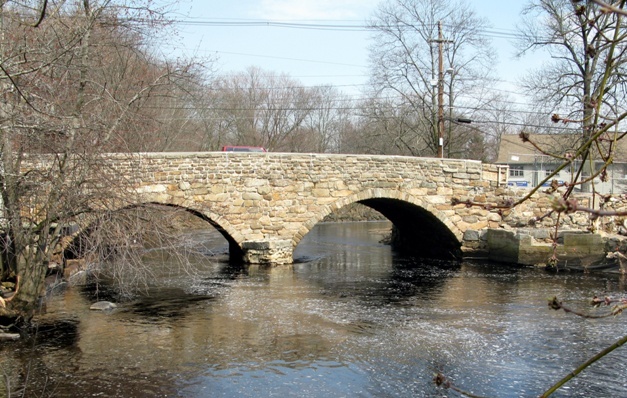 and the Choate Bridge was built forthwith at a cost to the town of £498. This commemorative stone was added to the parapet when the bridge was widened. 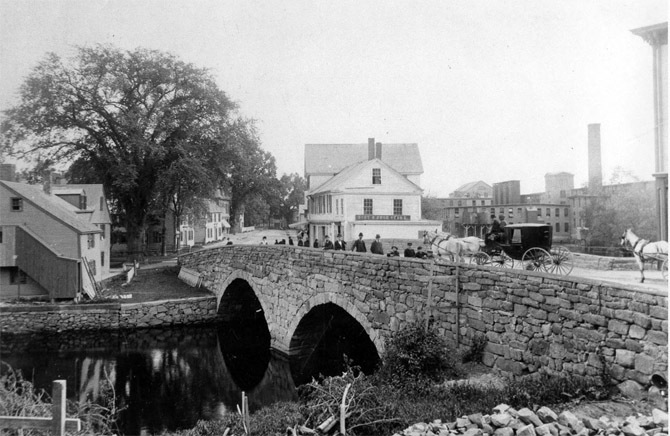 Construction of the bridge came just in time for the age of the stagecoach, which made its first trip through Ipswich in 1774. Drawn by four horses, it connected Newburyport with Boston, with an overnight stay at Treadwell’s Inn on Town Hill. 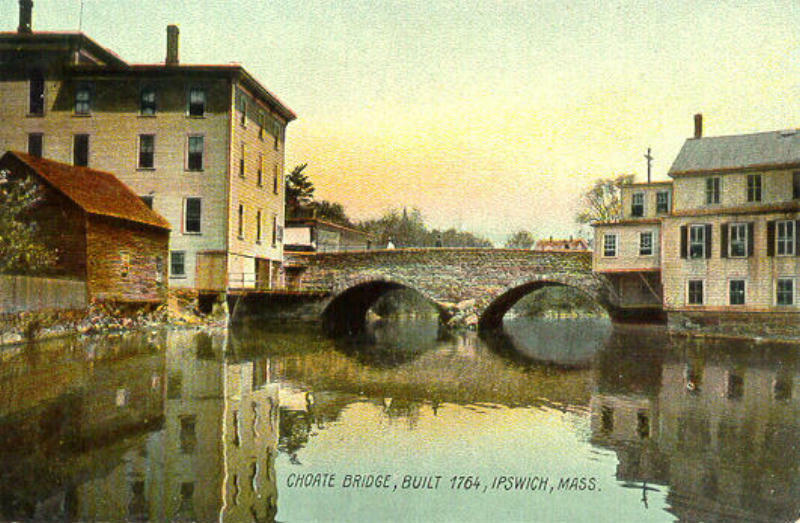 John Adams, Daniel Webster, Lafayette and George Washington all visited Ipswich and passed over this bridge. Courts were held here, a larger inn was built, and both of those inns are still standing. By the 19th Century, up to seventeen stagecoaches passed through town each day, full to overflowing, and they all arrived by way of the Choate Bridge. Dr. John Manning built an innovative but unsuccessful windmill at the spot where the Choate Bridge Pub is today. 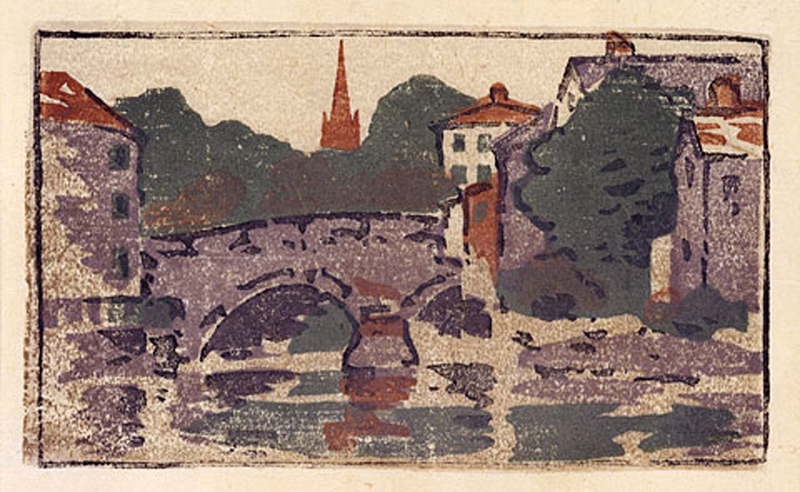 In 1829 the bridge was again too narrow for the ever-increasing volume of traffic. After much deliberation about how to widen it, the selectmen determined to do nothing. 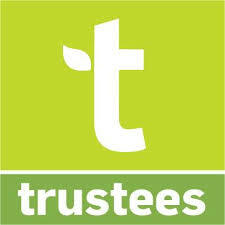 Five years later the County adopted the project and assessed the town $1200 for its share. Funds were raised through a lottery, but disagreement over which side of the bridge to widen delayed it again. 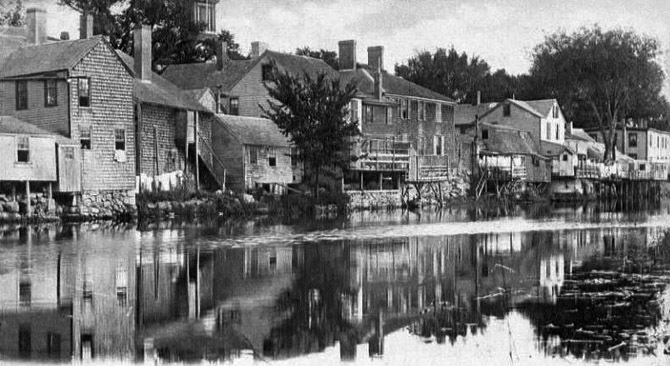 In 1837 the town cleverly petitioned the legislature that the Ipswich River is tidal and the expense should therefore fall solely on the state. The State disagreed and the County went forward,, assessing the town $1037.50, thus handing the town the dubious victory of saving $163 by delaying construction for 10 years. 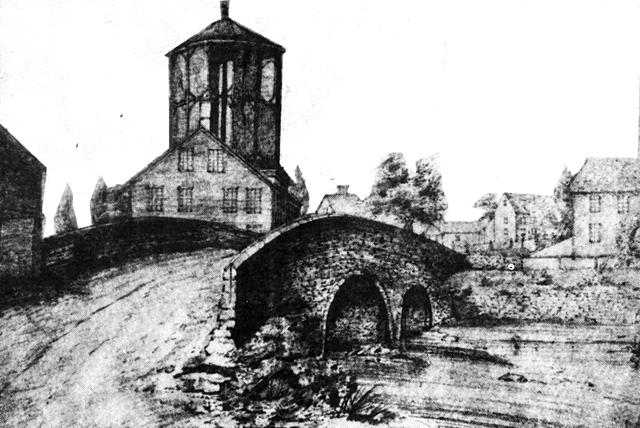 The bridge was widened in 1838. In 1968, the volume of traffic on the North Shore had grown such that the Massachusetts DPW proposed construction of a third beltway around Boston. The so-called Middle Circumferential Highway would have plowed through Willowdale State Forest, Bradley Palmer State Park and Appleton Farms, bypassing downtown Ipswich altogether. The good people of Ipswich put a stop to that, as well as a nuclear missile site and an atomic power plant that were proposed for Town Farm Road. 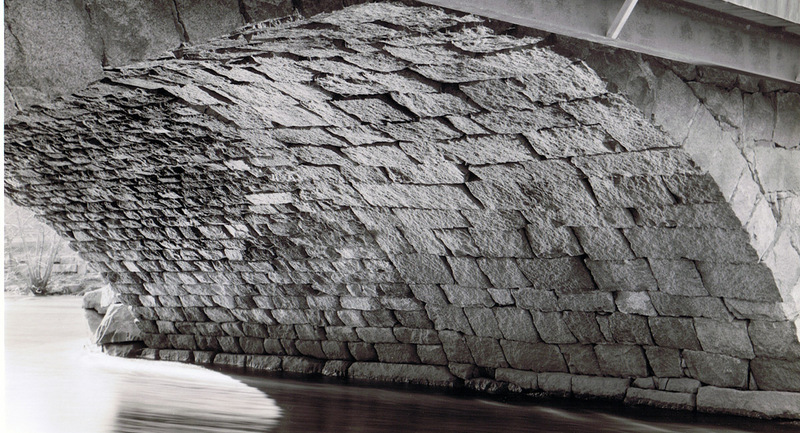 This 250 year old bridge that the naysayers claimed would never survive its first day has stood the test of time. It cost our town £500 to build, $1000 to widen, and some occasional upkeep. When I consider every horse, buggy, stagecoach, car, truck, bicycle and pedestrian that has passed over Col. Choate’s bridge since 1764, that seems like a really good deal. 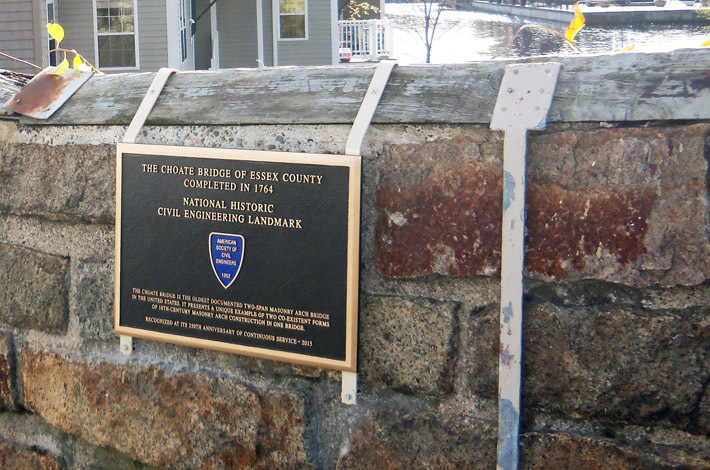 Plaque awarded by the American Society of Civil Engineers to the Choate Bridge. Great article! Thanks for all the background.